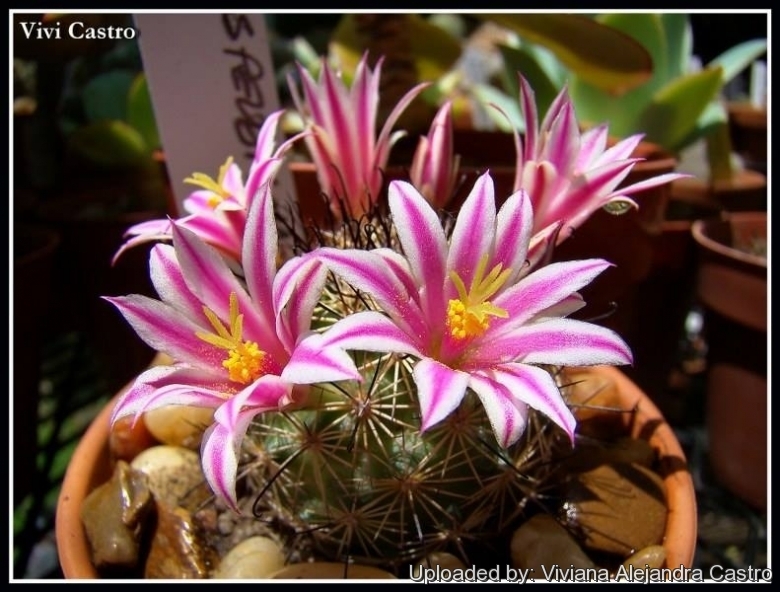 Origin and Habitat: Mammillaria blossfeldiana has a relatively wide rang in the Mexican state of Baja California (Baja California and Guadalupe and Cedros Islands. (extent of occurrence ca 8,000 km2). The species is locally abundant, it has a patchy distribution. Altitude range: Altitude below 0 to 150 metres above sea level. 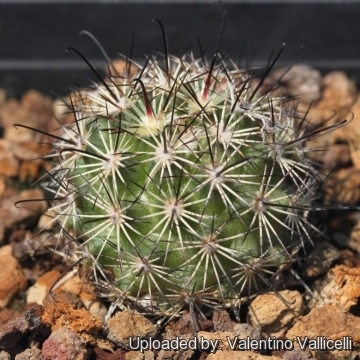 Habitat: Mammillaria blossfeldiana grows in Arid plains near the coast in Lower Sonora Desert zone at Santa Rosalillita in, hot, decomposing granite and gravelly soil, often scarcely showing above the surface. Further north near the coast at Punta Baja, Boca Marrón, Punta María; and further south near Mezquital this species grows on steep slopes. At present there are localized threats but it grows in coastal areas where human impacts tend to be severe and can affect the subpopulations rapidly in the near future. The species is used as an ornamental, for which it is illegally collected from the wild. 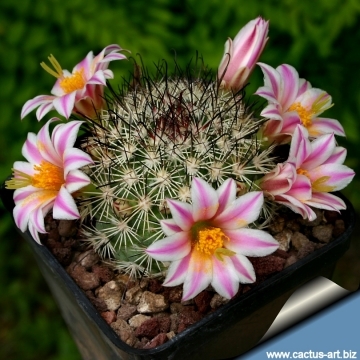 Description: Mammillaria blossfeldiana is a rather small plant, usually solitary or slowly branching, with superb showy flowers. Stem: Globose to cylindrical, grey-green, 4-10 cm high, 3 - 4 cm in diameter, without latex. Tubercles: Short, conical, 3-5 mm long, about as long as large (or larger) ± quadrangular at the base. Axil almost naked, or with a little short wool. Radial spines: 11-20 rid, acicular, white-cream or yellowish with darker tips, 4 - 7 mm long. Central spines: 3-4, about 8-12 mm long, of which the lowermost one is erect, dark brown to black, and hooked, while the upper 2 or 3 are straight, acicular and paler. Fruits: Club-shaped, 14-20 mm long, orange-red to scarlet. 5) León de la Luz, J.L., Gómez-Hinostrosa, C. & Hernández, H.M. 2013. 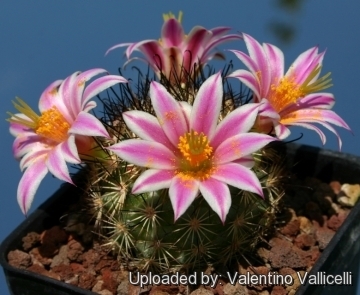 Mammillaria blossfeldiana. The IUCN Red List of Threatened Species. Version 2015.2. <www.iucnredlist.org>. Downloaded on 07 August 2015. 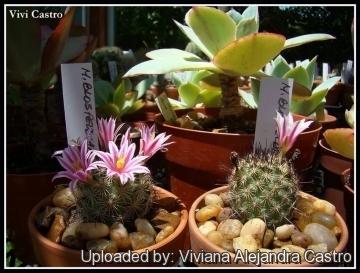 Cultivation and Propagation: Like most hooked spined species from Baja California, this plant isn't noted for being easy to cultivate, but in good conditions with excellent ventilation, it grows without difficulty. It is especially sensitive to overwatering, so careful watering and an open mineral potting soil are a must to extend the life of this species. Avoid the use of peat or other humus sources in the potting mixture. Don't add limestone to the potting mix, which must be moderately acidic. Can be sensitive to frost. 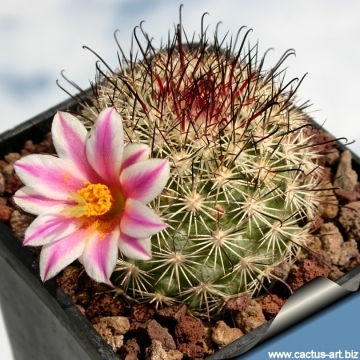 It requires maximum sun exposure to reach its full potential, and to achieve success in flowering. A winter rest that allows the plant to shrivel (perhaps losing up to 25% of its summer height) will encourage flowering and long time survival. Be careful to encourage slow growth. The careful grower will be rewarded with generous numbers of large white and pink flowers.